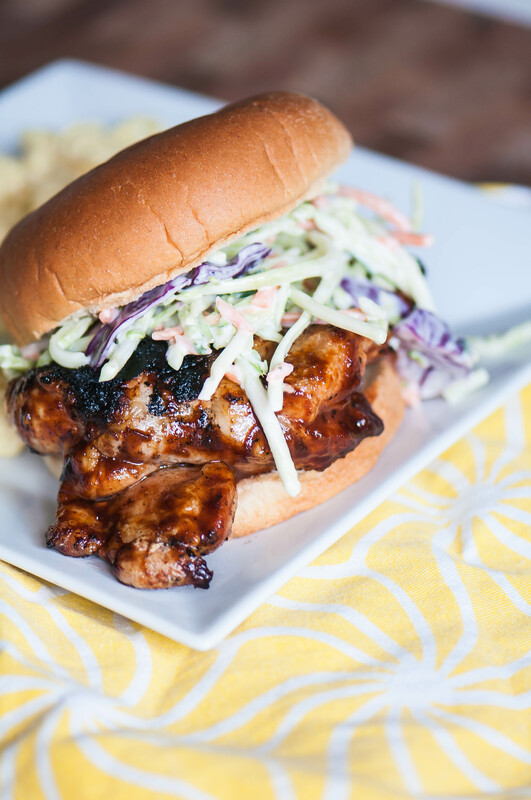 Change up this summer’s barbecue menu with these simple and delicious BBQ Chicken Sandwiches with Broccoli Slaw. A soft potato bun, a quick slaw and sweet and spicy BBQ chicken create the perfect sandwich that will make you forget all about the cheeseburgers. It’s July guys. Cliche coming up but I can’t believe how fast summer has gone so far. Two weeks ago my kids were in VBS for a few hours each day which was the best and I almost shed a tear that Friday as I dropped them off. I managed to get so much blog work done, it was crazy. Funny how productive you can be in 3 hours when there isn’t bickering and whining going on. Last week my parents took Noah for two days for their annual “sports day” when they play golf and go bowling. They also went to see Captain Underpants and of course a visit to the children’s museum. We met up on Wednesday and spent the day together then she took Hannah for a couple days to go to the zoo and do fun girl things Noah complains about. So needless to say, the past two weeks have been weird and relaxing and we’re back to real life this week. I keep telling myself I only have to make it a few weeks then we are on our way to Jamaica. I mean, the kids are coming with us so it won’t all be laying on the beach and cocktails but they love the beach and swimming so they don’t usually have the urge to fight. Yay! With summer in full swing, I have grilling and barbecue constantly on my mind and I have a confession to make. When I have the choice between a burger or a chicken sandwich I almost always go for the chicken. Is that crazy? I feel like it’s crazy. Don’t get me wrong, I love a burger but I’ve just always preferred chicken. And this bbq chicken sandwich is one of my favorites. Joel and I both grew up in places known for barbecue so I feel like it’s in our bones. This bbq chicken sandwich is pretty simple and straightforward but sometimes that just means it’s classic. Grilled chicken thighs slathered in barbecue sauce are always a good place to start. Instead of a traditional cabbage coleslaw I opted to use broccoli slaw for some added crunch and flavor. If broccoli slaw isn’t your thing feel free to substitute shredded cabbage instead. Layer all of that on a bun for a deliciously simple sandwich. To prepare the slaw: mix together mayo, vinegar, sugar and salt in a large bowl. Add broccoli slaw to bowl and mix to combine. Refrigerate until ready to eat. It tastes better if made a few hours ahead of time. Preheat grill to medium-high heat. Season both sides of chicken with salt and pepper. Grill chicken on one side for 6 minutes, flip and brush with barbecue sauce. Cook another 6 minutes, flip and brush second side with barbecue sauce. Cook 2 minutes to caramelize sauce, flip and cook another 2 minutes. Remove from grill when cooked through. To assemble chicken sandwiches, add chicken and slaw to buns.